From the evening of 26 December 2018 to the evening of 16 January 2019 I didn’t eat any food whatsoever – I only consumed filtered water – it was a 21 Day Water Fast. 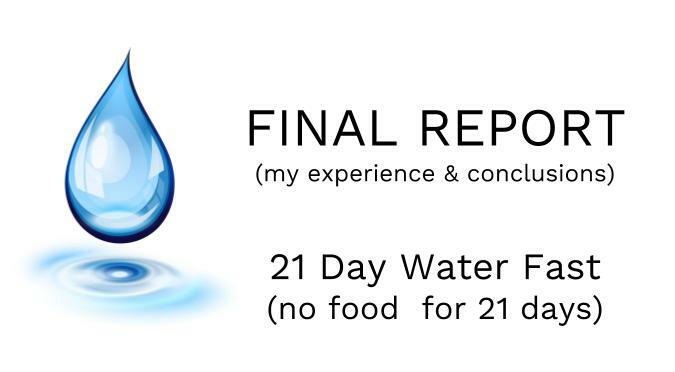 I’ve previously posted on – Why I chose to do a 21 Day Water Fast – and – My experience up to Day 14. You can read these posts for a deeper explanation but the short version of my objective was that I wanted to achieve a physical and mental reset. I had certain specific objectives and I’ll discuss my progress on each of them. It’s certainly been an interesting exercise. Your body is complicated and everyone’s experience will be different – I am certainly not advocating that you do an extended fast….it’s only something you should do after careful research, consideration and taking medical advice. For me – it was more of a mental challenge than a physical challenge. Amazingly I didn’t feel any hunger whatsoever throughout the fast…maybe it was my mental preparation – I’m not sure. Having said that, I was certainly very weak near the end of the fast….but this is what I’d expected….my friends were concerned (some even alarmed)….but I’d prepared myself mentally…so it was ok. I mainly rested – there’s no way I could have worked a full day during this period. Certainly I was comforted in the last week, knowing that I would soon be eating again. Gandhi the father of the modern Indian nation fasted often – for self-purification and political protest. He did two 21 day fasts. I thought of going 22 days but that would be a bit like outscoring Bradman – somehow inappropriate. In 1933 he fasted for 21 days with the objective of improving the conditions of the “Untouchable” caste. The population of India, then about 300 Million, waited for daily news of his condition. Me – I got a few phone calls from my Mum. One of the key things to be careful of – with any long term fast, is how you break it. Diving back into two McDonalds value meals would risk hospitalisation. 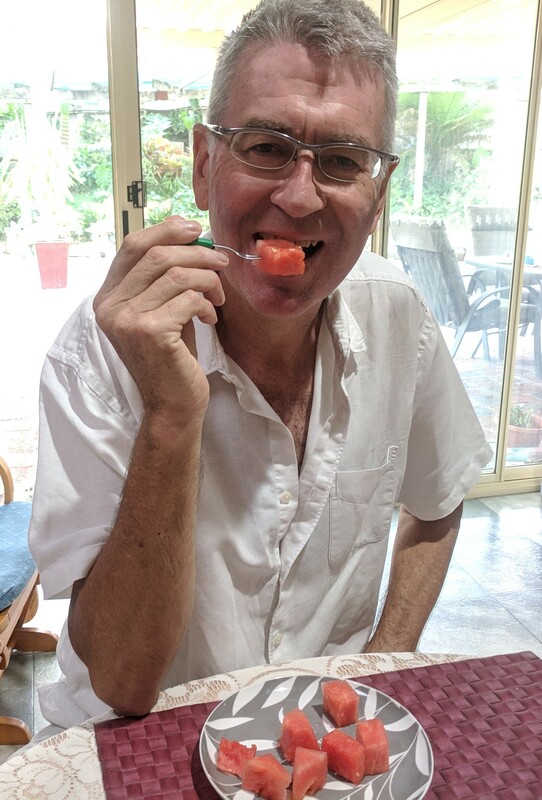 I broke my fast with a tiny serve of watermelon on the evening of 16 January 2019…as it happened, my father’s 81st birthday. For the next day I ate small serves of watermelon at about 2 hour intervals. The following day I had rockmelon at roughly 3 hour intervals. The next few days I consumed vegetable soup, then solid vegetables for a few days. I was pretty much back to a normal diet after a week…although I’ve made some dietary changes as I’ll explain later. One of the big changes that needs to be permanent is a reduction in my alcohol consumption which I’ll refer to later. Days 15, 16,17 were normal. I was certainly feeling weak and anything more than 2 hours of activity would tire me out completely. I certainly couldn’t have worked full time during the fast. I started to get a pain in my left foot – on the big toe and the back of my heel. I’m sure that it was a mild case of gout – a condition caused by a buildup of Uric acid. A gout attack is often triggered by certain types of food or alcohol. For me – it’s traditionally been an overload of red meat and red wine. So why would I have a gout attack when I wasn’t eating or drinking anything other than water ? A doctor friend thought that it might be because my kidneys were under stress. I’ve got a different theory informed by a personal precedent. After my Indian trip of January 2018 I changed my diet to dramatically reduce my intake of red meat…..I’d previously reduced my intake of red wine. About 45 days after I changed my diet I had a significant gout flare up. It didn’t make sense at the time, but given what I have experienced here – my theory is that the flare up came as the body was in the process of clearing the Uric acid. Here are my Uric Acid blood levels. So, I had a gout flare up as my Uric acid levels were dropping – I’m sticking with my theory. It will be interesting to see what happens to my Uric acid levels from here – but I’m shooting for further falls. For a few days the pain was bad enough (particularly my knee) that I took some medication – a mild steroid apparently. And my CRP blood score (an indication of inflammation) was off the scale high….I put this down to the gout…but maybe it was something else…we’ll see at my next blood test in about 60 days. Probably the only thing to note on these days was the ongoing problem with the gout flare up. Over these days…the left toe improved first, then the left heel, whilst coincidentally the right knee flared up…and that caused most discomfort for about about the next 9 days. As I write this – 26 days after the fast, I have no residual signs of any gout. As you might imagine – it took some time for my strength to return. My bowels reawoke late on day 23 with a chirp and a full message on day 24. I’d assess my strength at the end of the fast as about 50% of normal. I didn’t notice much change until about 5 days after the fast…I basically went sideways – but I knew that a return to strength was coming as I ingested a greater volume of increasingly nutritious food. After about day 26 (5 days post fast) I grew a bit stronger every day – maybe stepping up in 5% daily increments over the next week – so by 12 days post fast I was feeling about 85%. As I write this – 27 days post fast I feel about 95%. Some of my research indicates a return to full strength about 6 weeks post fast. I had a number of physical objectives with my fast – which I documented upfront. My blood pressure has been above the norm for some time and I’ve previously taken meds – but never felt comfortable with the idea of taking medicine for life. There’s a family history and many describe it as “genetic” a natural process of aging (I’m 55). In the lead up to the fast I was off all blood pressure meds. My blood pressure and my pulse seems to bounce around a fair bit…so not quite sure what that means but I suspect that my hypertension is not hardwired but influenced by a number of factors. I’ll present these numbers as the average of 3 consecutive days…maybe not 100% clinically sound but it provides an order of magnitude. Now – what should blood pressure & pulse be ? But that’s basically the line where they recommend meds – it doesn’t indicate an optimum or healthy state. 110/70 is better and optimum is more like 90/60.. So – right now I’m considerably outside of that…although noticeably different to pre-fast. At the 5 day post-fast mark I was feeling very pleased with myself but a doctor friend said “your blood pressure is only so low because you’re so weak – it will revert back to normal”. Is she right or is something else going on ? Like most things to do with the body it’s complicated…looking at one measure in isolation is dangerous. So – what else might be going on ? I haven’t had much red meat (or even white meat) at all..
And I’ve resumed drinking alcohol – although at a fairly modest level (more on that later). Could one or more of these factors be at play ? I could test these factors in isolation now with a “dairy free month” or an “alcohol free month” and see if that moves my blood pressure dial. Maybe – it’s improved aerobic fitness – that’s something I need to work on. Maybe it’s all of the above – maybe it’s cumulative – everything is connected. But – at the moment my best guess for the highest impact factor is stress – maybe not mental but in particular physical. During the fast I started seeing a chiropractor for a persistent neck pain (unrelated to the fast). I’d known that I was inflexible but this was a stark reminder that I need to work on flexibility and posture. As a friend once noted “you know you’re getting older when you do a hammy gardening”. There’s a lot of research that indicates that mental and physical stress are a factor in hypertension. “The carotid bodies lie at the bifurcation (fork) of the common carotid artery on each side of the neck and are the body’s smallest organs, each about the size of a rice grain. “These organs sense chemicals such as oxygen in the blood. It’s also well established that yoga can have a modest impact on hypertension. My issue with prescription drugs in cases like this is that they’re too easy – you just pull this one lever without dealing with the underlying causation. If all else fails – then I’ll go on the meds..but ideally a low dose. OK – so this is where it gets weird. Last fasting day was 16 January…so bloods were taken 8 days after feeding commenced. So – pre fast…compared to 2011 & 2013 good (HDL) is down (35%) but the bigger mover is bad (LDL) down 44%. Meanwhile my triglycerides jumped substantially..
My take is that everything has been disrupted and that it needs to settle down before any conclusions can be formed. So – I’m going to do another set of bloods about 90 days after the end of my fast to see where things sit. [Bloods done 22 February 2019 reveal a return to normal of Triglyceride and an increase in HDL and LDL. I have Hemochromatosis….a condition that causes elevated iron levels. Ignored – your iron levels just rise and rise and eventually your heart and maybe other things are buggered. The treatment is simple – regular blood letting – known as venesection. Basically the exactly the same process and volume as if you were doing a normal blood donation at the Red Cross. For me – about quarterly seems to do the trick. There are several genetic triggers for the disease – Mine is the HFE gene, which seems to be the less aggressive of the genotypes. So there’s a few interesting things to observe here. Firstly I changed my diet in early 2018 after my trip to India – in particular I now consume dramatically less meat (red meat in particular) and more fruit and vegetables. Throughout 2018 I did no venesections (bloodletting) so it’s really interesting to me that my pre-fast results are so good – in particular my Ferritin. Post fast my Iron number has reduced to the equal of earlier results, whilst Transferrin & Transferrin S. numbers have gone in the wrong direction. BUT the big mover is Ferritin – off the scale up. This doesn’t really make any sense as at that point…I’d basically been going 27 days with no iron entering my body. My (after) hemoglobin result was within normal range (although lower) whilst my Red Blood Cell count was lower and slightly below normal range. I suspect that my high number indicates “ferritin on the move” as the body is sorting out and “catching up” on dealing with my iron situation. [Blood test results of 22 February 2019 indicate a dramatic reduction in Ferritin, with all other indicators heading in the right direction. It will be interesting to see in another 30 days, whether there is further improvement. My medico friends will laugh at me for that statement but that’s been my belief going in to this fast – that, all other things being equal and in the absence of a crisis (like infection) the body is working towards optimum health. It’s doing whatever “processing” that it needs to do to restore health. The basic idea of a fast is to not put anything “bad” in (e.g. “bad” food) , rest and let the body do whatever it feels the need to do. Why does the body have a mechanism to create fat and then in reverse consume fat ? Well, obviously to tide us over “lean” times. Do you think we evolved to have 3 “large” meals at set times throughout the day ? Were our bodily systems designed not to cope with seasonal variations or potentially significant interruptions to food ? I think not. Of course, the proof will be in the pudding when I do my next set of bloods. After my next set of bloods I’m committed to recommencing quarterly venesections. Everything is connected, so who knows what impact (even slightly) elevated iron levels might have on some other bodily function. My Renal function results were all within normal range apart from Urea which at 9.4 (up from 6.2) was upper range of 8.5. Total Protein, Albumin, Total Bilirubin and Globulin were all within normal ranges. Alkaline Phosphatase, Gamma GT, AST, ALT & LD (all enzymes) were all elevated outside normal ranges – some significantly. So – we’ll see how these settle down at my next blood test. If they remain elevated, that would be a cause for concern but that’s not what I’m expecting. There was a lot happening in my body and the liver was doing most of the heavy lifting – but again – everyone’s different. Maybe my hemochromatosis (the iron thing) impacted upon my iron levels and that caused additional stress on my liver. Who would know ? – everything is connected. Interestingly (and without any prompting), several friends said that my eyes looked “clearer” or “brighter”. I’d read reports of people’s eyesight improving through fasting and I had the ambition of doing a lot of eye exercises and going without glasses for much of the time. As it turns out that was probably too ambitious. I got my first set of glasses in grade 6….suddenly I could see the blackboard again. Originally I wore them only during class but when I started work at age 17, I started wearing them full time…. I even had a pair of sports glasses – Kareem Abdul Jabbar was my soulmate. Progressively my eyes got worse – cause that’s what happens right ? I used to rejoice that I lived in the modern times. Glasses were invented in the late 1300 most likely by a Northern Italian. Every few years, my optometrist would “crank up” my prescription. About 4 years ago I ended my marriage, caught my breath, dusted myself off and started to examine a whole lot of stuff that I’d presumed to be true…. As Roy & HG might say, I stepped into a room full of mirrors and had a good, long, hard look at myself. One of the things I looked at was my eyesight. For nearly 30 years, the first thing I did in the morning was put my glasses on. Sometimes I’d misplace them and I’d literally need some glasses to find my glasses. I considered myself blind as a bat. But like often happens, when you go searching – a few ideas resonated with me…. One article – called – What’s so great about 20/20 ? This was an essay written by an optometrist…. Until that moment I’d rushed into the darkened room of my optometrist every few years and squinted through his machinery. Shortly afterwards he’d announce that my eyes were even more buggered and give me a script for ever more powerful glasses. Basically this essay gave me the insight and even permission to take my glasses off regularly. I started to read without my glasses…and it felt increasingly comfortable…. I dug out some old glasses, with a lesser prescription and started wearing them on weekends…guess what – I could function just fine…. I booked the first appointment in the morning on a day I knew was going to be sunny. For that morning I didn’t put my glasses on and I practiced focusing on car number plates and signs of all types. Before I went into that darkened room I did some deep breathing exercises and got myself into “the zone”. And I asked a different question of the optometrist.. Guess what – it was quite a reduction – and I could function just fine. I’ve now done this several times..
5 years ago my script was -5.00 & -5.75. And it’s affected me profoundly….I feel like I’ve got a much wider field of view and a different depth of field. My eyes, literally and figuratively have been opened. The world looks and feels differently. I’ve had my new glasses for about 10 days now. Are they as “sharp” as my old glasses ? No – but they’re better in other ways and my eyes (and brain) are already adjusting. These new glasses are “softer” and I’ve got a different (better) depth and breadth of field. Interestingly – the issue of focus is complicated. I notice that for certain colours, in certain light, the image is very clear, whilst for others there’s a slight colour “flaring” around the edges. To get a clearer image, rather than squinting, I actually need to open my eyes more and then (it’s hard to explain) “soften” my focus….the eye feels like it “melts” slightly and the image becomes clearer. A big advantage of my prescription is that it’s much better for computer work – which is a great benefit. My vision also becomes clearer after I face the sun for 30 seconds or so, with my eyes closed. You can feel the sun penetrating deeply into the eye through the eyelids. My current plan is to wear my new (weaker) glasses for the next 6 months or so and then reassess. Even if there’s not much more improvement to be had in my left eye, I’m sure that I can lessen the prescription in my right eye, thereby reducing the differential between the eyes. It would be a good outcome if I got both eyes to -2.5. Either way, If you’d told me 7 years ago where I’d be at today – I wouldn’t have believed you. I was skinny up until my late 30’s and then life (and lifestyle) caught up. My peak weight in my mid 40’s was about 93kg. My starting weight at fast commencement was 86.6 kg. For the first 4 days, my weight loss averaged 1.225 kgs per day as all of the food “work in progress” was processed and eliminated. From day 5 I averaged about 470 grams loss per day. At day 23 my weight was 73.5 kgs for a peak loss of 13.1 kg. I’ve since put 5 kgs back on. This morning I weighed 78.6…. And that’s about where I want to keep it, a net reduction of 8kgs. If you’d asked me before I started the fast I would have said that my target was 81 kgs but I’ve since lowered my sights. One of my objectives was to reduce my visceral fat – the dangerous fat around the belly and around the internal organs. My expectation was that the fat would fall off of my belly first. Surprisingly my legs, arms and upper body seemed to lose weight quicker than my belly. Not that I’m porky, but even now – I reckon I could lose 2 kgs from my belly before I’m within striking distance of a six pack. So – I could drop some fat and add some muscle and I’d look better. As they say in the classics : losing weight makes you look better with your clothes on, exercise makes you look better naked. Many fasters complain of difficulties sleeping. I didn’t experience that – in fact I slept better, often with substantial naps during the day. I was expecting that I’d experience caffeine withdrawal but that didn’t happen. I’m guessing that being alcohol free was very beneficial here – maybe caffeine as well to some extent. Alcohol is the more obvious sleep disruptor for me. I feel like I’ve got more work to do on my sleep but I’m definitely sleeping better – and longer. I’m not measuring it precisely but I’d say I’m easily sleeping 30 + minutes extra and my sleep is quite “clean” , no major disruptions. On the few nights since my fast ended where I didn’t sleep well coincided with (surprise, surprise) a consumption in excess of 3 drinks. You don’t have to be a Rhode Scholar to join those dots. I haven’t noticed anything post fast – but I’m on the lookout for it. I’ve certainly noticed that wheat – in bread or beer quickly makes me feel bloated. I was expecting withdrawal symptoms, but they never came. I was also wondering whether caffeine influenced my pulse rate and / or my blood pressure. Doesn’t look like it does. Resuming coffee was one of things I’ve enjoyed the most. But is it having a negative effect on my sleep ? Not as much as alcohol – buy maybe. Caffeine leaves the body reasonably quickly – so the key thing is to not drink caffeine after say 2pm. I wanted to use the fasting period to reflect on my alcohol use. I’d felt that recently I’d been drinking too much, particularly in the lead up to Christmas – often 5 or 6 days per week. All socially, never at home. And it was good to know that I didn’t miss alcohol, at no stage during the fast was I craving for alcohol – I drink socially – for me it’s an ingrained social habit. During the fast I investigated several tools. One is the Daybreak App, which is financially supported by the Federal Government. You’re asked to nominate your objectives. “ I would like to be drinking less or maybe not at all. There’s a lot of personal stories or mutual support. This might be really useful for some people – I don’t feel like I need any of this – the ball is totally in my court. Since I’ve resumed drinking (21 days) – I’ve had 8 alcohol free days. So – I’ve already fallen behind my target alcohol free days…..and I’ll chalk that up to making up for lost social ground and rookie errors.. I am serious about being mindful re alcohol and regularly “stepping in to the room full of mirrors to have a long hard look at myself” about this. Australia certainly has a drinking culture and it’s easy to be swept along in social situations. But I’m determined to make positive change….I’ve done it with my diet….I’ve fasted for 21 days…..FFS – I know that I’ve got significant willpower. I can do it. So light and mid-strength beer might be part of the picture. I also need to be disciplined. 1 glass is fine. 2 is ok. 3 is on the verge of a slippery slope. At 3 I reckon my judgement wavers. From 3 it’s a slippery slope to 5….fries at the bar and a yiros on the way home. Once, I even accidentally slept with someone. 3 drinks is potentially the kryptonite to my super willpower. As with diet – it’s all about mindfulness. Just being mindful of what you’re doing. I feel like I just need to formulate my own “idiot proof” rules, custom designed by me, for me. Right now I’m not feeling that I should go permanently alcohol free. But if, ultimately I should, then I will. It’s not illegal and other people have done it. Willpower is one of my super strengths – so if I need to – I will. I was aware from my reading that other fasters noted weird things that happened in week 2 or 3. Sometimes they felt ill on one day for no apparent reason. The theory is that on that day your body is processing something bad that’s been tucked away in your fat stores – maybe for years. I was shooting to consume 3.0 litres of water per day. In reality I averaged 2.7. My average urine out was 2.0 litres. Interestingly (and surprisingly) my urine remained an amber colour throughout. I thought by the end of the fast it would be the colour (if not the taste) of Evian. On one day I had a blackhead breakout on my nose. Next day it was over…A few days later…same thing on my back. It was as if the body was going around flushing stuff out of my skin. My tongue turned white (as everyone reports) and then pink again about day 19….that’s supposedly a sign that you are ready to end the fast. With the benefit of hindsight I reckon that I’d been carrying a mild yeast infection (which is quite common). Before that fast – often in the mornings I’d have a bad taste in my mouth and a slight coating on my tongue. That’s now gone. I noticed ongoing discharge from my nose and eyes.. Quite a bit…not runny but dry. To use common parlance…snot & sleep. Again – it just felt like the body was quietly & simply purging waste “stuff”. Other fasters report an unusual amount of earwax secretion. I didn’t notice that. Later in my fast I noticed a distinct softening / shrinking of various scares. All types of scars – from a car accident, football injuries to acne scars. Quite extraordinary – it was as if the body was looking to harvest any non-mission critical body bits…. I’d read about this from other fasting reports…but can’t find any documented research on the topic. My objective had been a physical and mental reset. I achieved a physical reset. I’d say that I only achieved a partial mental reset. Many fasters report an amazing spiritual awakening. I didn’t get that….maybe my mind was too busy….I certainly didn’t really get anywhere with meditation. I read and was researching stuff. I had lots of ideas…that I was working through…..and the mental challenge of not eating – particularly the preparation and social rituals weighed heavily on my mind – especially in the first 2 or 3 days. Maybe I’d already made some progress previously in this area.. But I do need to do more disciplined work in this space. I certainly gained mental strength and confidence from achieving 21 days of fasting. If I can do this – many other challenges of willpower should be easy. If I was ever in a “survival” situation (as long as I had water – and could moderate my activity) I would have great confidence…. I can easily go camping or hiking for a few days with minimal supplies. So – how to explore the mental side of fasting ? I’m thinking that I might do a shorter term fast – maybe 4 or 5 days…in solitude…maybe camping in an isolated bush setting. No books, no phone. That might yield something different, some profound insight (s). I’d previously made some substantial changes to my diet in 2011 – see what I wrote at the time. I made further changes in early 2018 after a trip to the South of India – primarily much less meat, particularly red meat. At about the same time my youngest daughter (15) decided to become a vegan – so I’ve cooked quite a few vegan meals with her in the past 12 months. Keep going with low meat consumption. If using meat – it should be wild, grass fed and not just muscle meat. Ideally cooked on the bone or used to make stock & soup. So – for red meat – kangaroo, goat or lamb (at a pinch). The only red meat meal I have cooked since the fast has been a slow cooked Red Thai Kangaroo tail curry – very yummy. The closest I can find to “wild” chicken. Avoid processed meat like bacon. Soups made with high quality stocks. As little “fast carbs” as possible – anything that is white – or once was white. Avoid wheat and yeast in any form. Organic fruit and veggies…ideally home grown or from a trusted farmer. There’s nothing wrong with simple raw meals. A piece of fruit can be a meal. A simple salad can be a meal. Drink more water. Drink less alcohol. Avoid processed food of any type. I’m going to see how that goes. None of the above is scary – more of a tweak. At the moment I’m eating a fair amount of cheese and plain yoghurt. If I don’t see improvement / feel good with that then I might drop / slash dairy. Beyond that – it would be vegan – and that no longer scares me. I’ve seen it up close with my daughter. Ok – in summary – what happened – what did I learn ? I learned how “hard-wired” food is into the practical and social fabric of my life. I nearly went crazy in the first few days…not because of hunger…but because I missed the habits of eating – particularly with others. I surprised myself with my own willpower. It’s a superpower that I can use on other things. I need to drink less alcohol…and avoid the dumb food choices I make after a binge. I’ve got about 90 days to resolve my blood pressure…if I can’t lower it naturally – it’s back on the meds for me. I need to work on my flexibility and posture – So 2019 will be the year that I take yoga and Alexander Technique seriously. Namaste. [I’m going to measure my current (in)flexibility to create benchmarks to measure my progress]. I’ve got to “hard-wire” some simple aerobic exercise into my routine – (gyms are not for me) – like cycling to my Sunday Coffee Club meeting. I learned that my target weight is less than what I’d previously thought. So far – It’s been pretty easy to hold my weight at this new level….I reckon alcohol is my kryptonite in this regard. If I want a mental reset – that needs to be the sole focus…I was over ambitious in this regard on this fast. So, I need a period in isolation to address this – probably 4 or 5 days to start with. Can I prove overwhelming health benefits of this fast ? Beyond a healthier weight – No – not yet. My “after” blood test results were done 8 days after the end of my fast. I thought that would allow things to settle down. In retrospect I might have done them at exactly the wrong time – as the body was on the rebound – coping with the new regime of food. Right now my blood test results are all over the place – in particular, liver function. [As of 22 February 2019…things have certainly settled. Renal and Liver function all normal. General Haemotology all normal (apart from MCH which is 32.1..upper normal is 32.0 – so I clipped the line). I’ll do another set 90 days after the end of my fast (in about 60 days) and see where things have settled. BUT – I do feel “cleaner” which I can’t really describe in any other way and I’m definitely sleeping better. I’m now prepared to do further experiments. I might go 30 days without alcohol. I might go 30 days without caffeine. I might go 30 days without dairy. I might go 30 days vegan. I might go 30 (or 60) days with an elevated level of aerobic activity. Pull one lever at a time and see what happens. Am I glad that I did a 21 Day water fast ? Yes. It opened my eyes to a few things about the way my body works and gave me some “clear air” for deep reflection on what I want and how I might move towards optimum health. I’m serious about locking in some of the changes (like weight loss) and working on others in a methodical way. I’m looking forward to a more flexible body and improved posture. The learning about my willpower is profound and I’m looking forward to a future solitary period of meditation & contemplation. Would I do a 21 Day Water Fast again ? Right now – I’d say yes….but not for at least a year, probably two. I’m thinking that I’ll do a shorter fast quarterly – anywhere from 4 to 7 days – a good friend who is now on their 3rd iteration of short quarterly fasts has noticed cumulative health benefits. I’ve already started interim fasting (16/8) and I consider that a “no-brainer” as well as sustained reduction in caloric intake (even though I consider “calories” junk science – a story for another day). I’ll share any further relevant observations after my next set of bloods. Quite a few people have said that my story has “inspired them”. I don’t want to “inspire” anyone to do a long term water fast but I’m happy to inspire you to be more reflective and mindful of your health, your mind, your body and any positive changes you might make. Good luck on your own journey – whatever that might be.